There is a clear consensus among young people that the best place to grow food is in a toilet. This non-scientific conclusion came to me over the course of 12 school visits around New York City last week, as I traveled around in my 1986 Dodge Truck Farm with my friend Curt. We were encouraging students to participate in our 2010 Wicked Delicate Garden Contest: whoever grows food in the funniest place--wins! 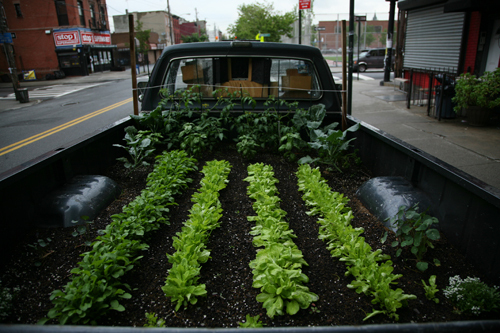 The inspiration for the contest was the .001 acre garden growing in the back of my old grey pickup truck in Brooklyn. 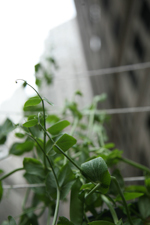 Originally planted simply because I didn't own any other space to grow food, Truck Farm has become a good excuse to explore quirky urban farms in the big city, and show young people how easy it is to grow your own food. While leaning on the old Dodge and taking a gander at the rows of salad greens, herbs and vegetables sprouting up between the wheel wells, students came up with all sorts of suggestions for where to grow food: shoes, hats, books, "my friend's hooded sweatshirt," and, repeatedly, the toilet. Although my initial inclination was to dismiss the suggestion as potty humor, the magnitude of the enthusiasm for Toilet Farm demanded further reflection. Why plant a toilet? As the students pointed out, there's plenty of water. Nevermind the lack of sunshine, I suppose, but could people's backsides be considered moonshine? No, the students insisted, these toilet farms would be decommissioned from their previous use. Light would have to come from grow lights, or toilets could be ripped from the plumbing and placed on rooftops, fire escapes, or sidewalks. Plug the bottom and plant away! Or perhaps one could imagine a miniature home version of the Living Machine, a series of wetland tanks that take in human waste and spawn plants and clean water. Could a living machine sprout from the fill-tank of every family's home crapper? Would you want your salad to come from your bathroom? Maybe the enthusiasm for toilet farms was more metaphorical. As one corn farmer pointed out in our film King Corn, "we aren't growing quality, we're growing crap." The crappiness of the modern industrial food system has received enough attention by now that most young people are aware of the trends: 1 in 3 young people is expected to develop type II diabetes, and 2/3 of all Americans are overweight or obese. An overabundance of cheap sweeteners, salty processed foods, and fatty snacks are ballooning America's medical bills, while access to fresh, healthful vegetables is a luxury not all can afford. Could a toilet farm be a not-so-subtle suggestion that we need to cut the crap and start growing better food? In any event, our problems of malnutrition and over-nutrition will not be solved in toilets--or in tiny urban farms sprouting up out of dying pickups. 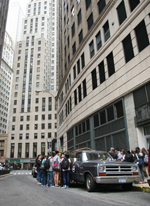 Although the growing size and number of urban farms is encouraging, the enduring value of urban agriculture may be chiefly educational: Truck Farm helps young people think outside the box. Look at it this way: because we've never had to feed 6.5 billion people before, building a better global food system is necessarily a project for the imagination. The fossils that fuel our current agriculture - through nitrogen fertilizers, diesel traction and shipping, and petrochemical pesticides - will eventually be gone. Older, more sustainable forms of agriculture undoubtedly hold some clues for the road ahead, but growing food for the future will require some bold new approaches. Inspiring the young is an old idea, but still a good one. Because even if the backs of pickup trucks aren't our agricultural panacea, perhaps one of the young people we visited will be inspired to develop something better -- and hopefully it won't be in a toilet.